Do you struggle with storing your lawn mower? Because we have struggled with this for…years. I don’t know about you, but we don’t have a great spot in our yard to keep our mower that will protect it from the elements and keep it out of the way. We have both a garage and a workshop, but they’re both pretty full of other things and a lawnmower takes up a lot of room. So, we decided to build a DIY lawn mower shed to store our mower instead. And, you guys, I love it! We partnered with Home Depot for this project, and you can find the full tutorial on their blog. I was surprised at how easy it actually was to build this shed, and I was super involved in the process. It feels good to learn how to build things, y’all! 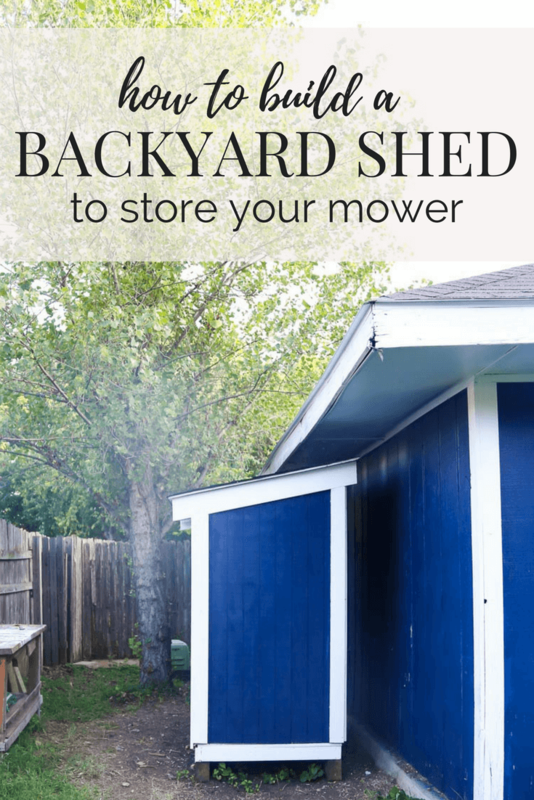 One thing we haven’t done to this shed yet that’s still on our to-do list is that we want to add some hooks inside the shed to hang things like our rake, shovels, and other outdoor tools. The goal is to have this handy little DIY lawn mower shed hold all of our backyard tools in one spot and keep them out of the workshop. An extra bonus? We built out DIY lawn mower shed on shed skids which means that when it’s time to move we can pick it right up and toss it into the moving truck. Or, gently set it into the truck. I don’t think anyone’s throwing this thing. With this, I can pretty much say we’ve completed all of the backyard projects we wanted to do this summer, and I’m declaring our yard “done”. If we weren’t moving we’d probably still have a few other things on our list (like replacing the fence and eventually extending the patio), but I’m pretty pleased with how far we came this year. Of course, the house is still getting painted in a few weeks (we’ve decided on colors and ordered paint, so step one is done!) and we need to do some pruning to all of the trees before we list the house, but that’ll come later. If you want to catch up on all of the projects we did this summer in our yard, I’ve listed them all out below. 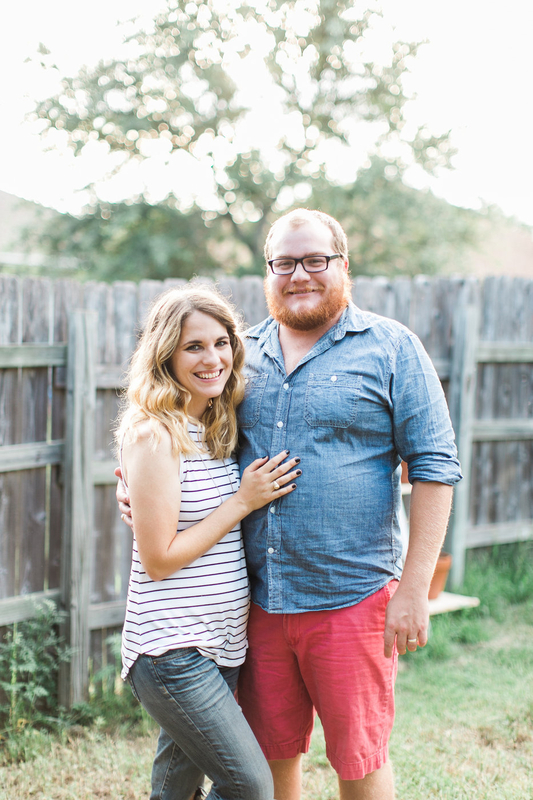 Be sure to check the first post to see just how far we’ve come with this yard. It was a mess at the beginning of summer! 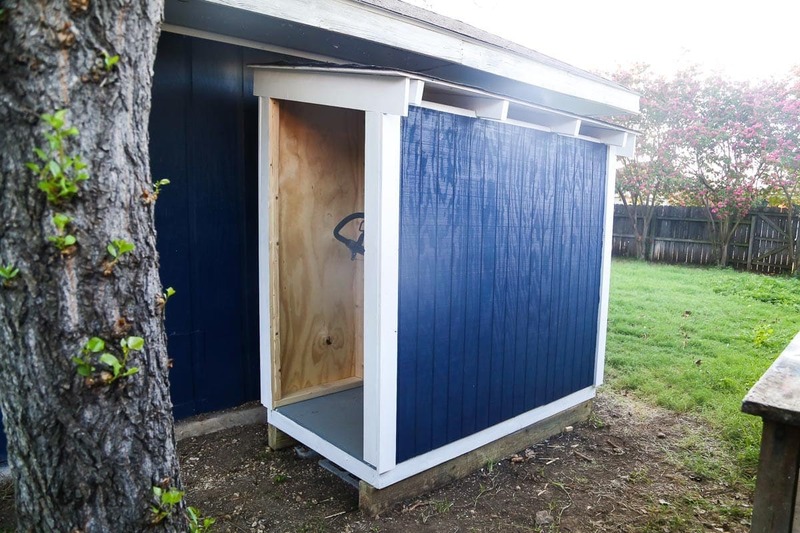 If you want all of the details on how this DIY lawn mower shed came together, be sure to check out the post on Home Depot’s blog today! 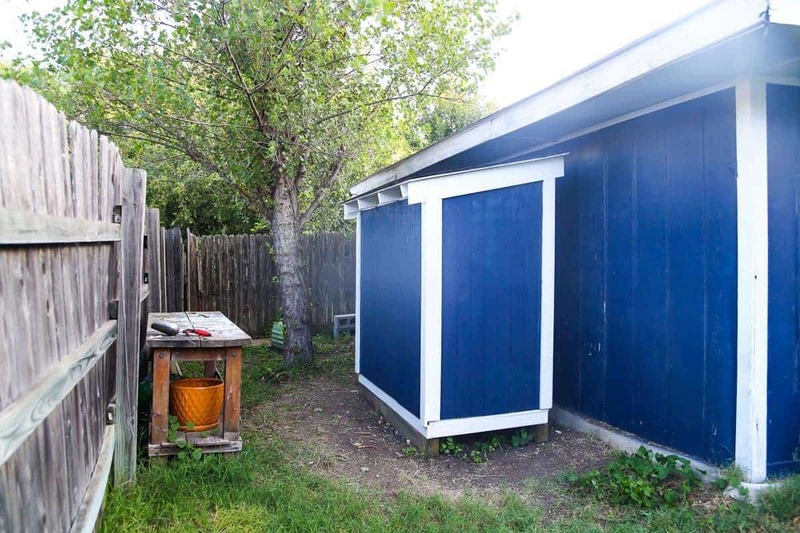 Hi Sonia – This shed was built with the intention of being able to move it eventually if needed, so the base is not attached to the foundation in any way. It’s extremely heavy, so it never shifted at all. However, if you know you want it to be in place permanently, you certainly could attach it.